For Herbert’s birthday this year, we threw him a small surprise party. And, he was quite surprised when we came out of no-where and started singing “Happy Birthday” to him as he was walking around the Prater with Letta. For the party, we spent 2 hours at the amusement park, where we rode bumper cards and went for a ride on the Riesenrad (ferris wheel). From the top of the wheel, we could see all of the familiar sites in Vienna. Somehow Herbert managed to get a discount on our ride (from 16 Euros down to 8,50), which made it even more enjoyable. Finally, we made our way over to the go-karts. We went for 10 minutes with “super speed”. 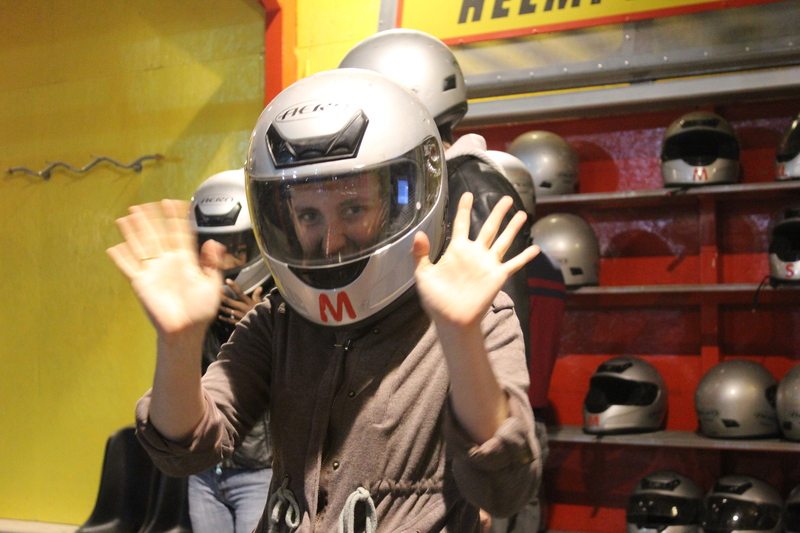 This was the first time I had been on a go-kart, and unfortunately, I think that I hurt my back. After watching from the sidelines, Chao and Morten say that I am a lunatic at go-karts — but do you really believe them? We ended our evening at the Schweizerhaus, a brewery at the Prater. These types of breweries are typical in Vienna, but this one seemed to be a bit more touristy than the ones with which we are familiar. When I made the reservation, I asked if we could have a cake with candles. They told me that I can buy a cake (45 Euros) and candles (1 Euro each) from our waiter. When we asked our waiter, there was neither a cake nor candles that we could buy. In addition, they ran out of the Stelze (pork knuckle). In the end, Michael, Michaela and I ordered three entrees and soups. The food was good, and the service was so-so (I never expect good service in Vienna anyway). I was quite disappointed in the lack of Stelze. For more photos of the event, check out my Picasa album. This entry was posted on March 23 2012 at 9:17 pm and is filed under Uncategorized. You can follow any responses to this entry through the RSS 2.0 feed. You can leave a response, or trackback from your own site.